Confirmation I and II is a two-year program for our 9th and 10th grade students. The Confirmation curriculum is taught by our Clergy on Sunday mornings. This program continues to enhance and strengthen our students’ pride in being a part of the Jewish community. Our participants study world religions, Jewish positions on contemporary issues, and explore their own ideas about Jewish traditions. Students continually speak about how Confirmation is one of the highlights of their Jewish educational journey at Shaare Emeth. 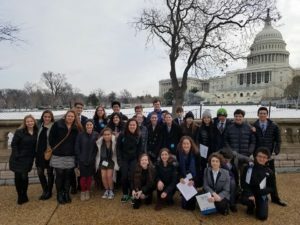 Our 10th Grade students participate in the L’Taken Seminar through the Religious Action Center, where they learn about social justice issues with teens from all over the country and have the opportunity to lobby their representatives on Capitol Hill!